Jimmy Spithill and Glenn Ashby have been brothers in arms for the past several years, their bond growing from skipper and coach to crewmates. Now they’re going head-to-head in an awards battle that pits Mr. Big Trimaran against Mr. Consistency. Spithill and Ashby are among the seven finalists (including two dinghy crews) for Australia’s Male Sailor of the Year award presented by Yachting Australia. The nominations recognize outstanding achievement during the period from Aug. 1, 2009, to Aug. 15, 2010. Spithill’s nomination is owed to his role as skipper of BMW ORACLE Racing in its victory in the 33rd America’s Cup. 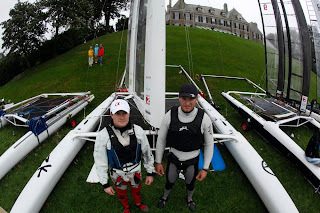 Spithill guided the giant, 90-foot trimaran USA and its 23-foot wingsail to a resounding, 2-0 victory over Alinghi. Spithill is just the second Australian to ever skipper an America’s Cup winner. John Bertrand set the mold in 1983 when he led Australia II to the victory that ended the longest winning streak in sporting history, 132 years. Spithill previously won the award for achievements in 2005-06 when he won the Melges 24 and match racing world championships. Ashby was nominated for his two world championships during the nomination period. 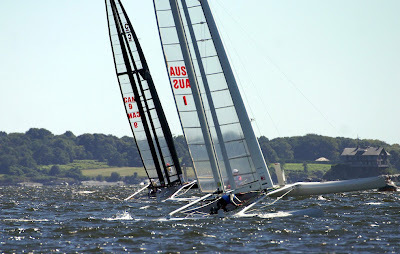 In September 2009 Ashby was crew for skipper Darren Bundock in winning the Tornado World Championship. It was their second consecutive Tornado Worlds and third since 2006. In July Ashby won his record-setting seventh A Class Catamaran World Championship, which ranked as the 14th world title in his career. As crewmembers, the duo reverses roles. Spithill crewed for Ashby at the F18 World Championship in July, placing 18th out of 80 in the Gold Fleet, and the International C Class Catamaran Championship last month, where they were runners-up. The awards are scheduled to be presented on Oct. 15.